Sodium chloride has multiple functions in drilling and completion fluids. It is used to increase the fluid density, reduces the freezing point of water base drilling fluids, inhibits hydrate formation, provides shale control. Additionally, it can be used as an internal brine for oil or synthetic base drilling fluids to balance formation salinity and avoid osmotic transport. It is used as a base brine for completion and workover fluids. It has advantageous over other divalent brines as it is monovalent and has no precipitation issues. We are offering high quality Sodium Chloride. NaCl, also known as salt, common salt, table salt or halite, is an ionic compound with the formula NaCl, representing equal proportions of sodium and chloride. Sodium chloride is the salt most responsible for the salinity of the ocean and of the extracellular fluid of many multi-cellular organisms. As the major ingredient in edible salt, Sodium Chloride is commonly used as a condiment and food preservative. this salt is heavily used, so even miscellaneous applications can consume massive quantities. In oil and gas exploration, salt is an important component of drilling fluids in well drilling. 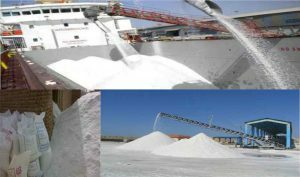 Iran Sodium Chloride is used to flocculate and increase the density of the drilling fluid to overcome high down-well gas pressures. Whenever a drill hits a salt formation, salt is added to the drilling fluid to saturate the solution and to minimize the dissolution within the salt stratum. Salt is also used to increase the curing of concrete in cemented casings. Salt is used to produce a drilling mud that prevents widening of bore holes in rock salt strata, inhibits fermentation, and increases mud density. Sodium Chloride has a limitation of 10.0 ppg when using it as a weighting material. Chloride and sodium ions can be an environmental concern depending on the operation regions. Sized NaCl are used as bridging agent in saturated brine for create a special type of reservoir drill-in fluid with minimized formation damage and easy clean-up. Salt is an important basic material which is used when drilling for other natural basic materials such as crude oil and natural gas, for example, in the drilling mud. The requirements of the drilling industry are high and very specific so that, depending on demand, either rock or vacuum salt in various qualities is used. increasing density, increasing shale inhibition by decreasing water activity, reducing salt dissolution when drilling halite salt sections, reducing the freezing point of water-base fluids and reducing the potential of forming gas hydrates Sodium Chloride (NaCl) is a widely available commercial chemical that can be used as a weighting agent to increase fluid density up to 1.2sg (10lb / gal). It is predominately used for formulating clear, solid free work-over and completion fluids. NaCl can also provide inhibition to formations containing water sensitive clay and shale. Our company supplying sodium chloride in different grades and different specifications for all the markets.